Options for health insurance coverage can be pretty limited in Alaska for small businesses and the self-employed. That includes commercial fishermen, who make up a major segment of the economy. Some in the industry say the cost and lack of access to comprehensive health insurance is a barrier to new fishermen and an ongoing concern for those already in the business. I have to disclose right at the beginning, I commercial fish part of the year but this story wasn’t originally going to involve me personally. I was just going to be the usual, detached narrator. I was confident that when I was working on my boat, I was covered by the comprehensive insurance my wife and I get through her state job. In the course of researching this story, I found out I was wrong. But I’ll get back to that later. The author during the 2013 troll season. Photo Credit: Elias Lichtenstein. Watkins is a slim, healthy, 36-year old who is married with two young children. He says his family used to pay for a temporary policy, hoping his wife could find a job with benefits. When she became pregnant with their second child, he says they were unable to qualify for a regular policy because insurance companies considered pregnancy a preexisting condition. They ultimately ended up getting insurance for the kids through the state-run Denali Kid-Care program. Watkins is playing it safer than many fishermen, who choose to forgo insurance altogether. 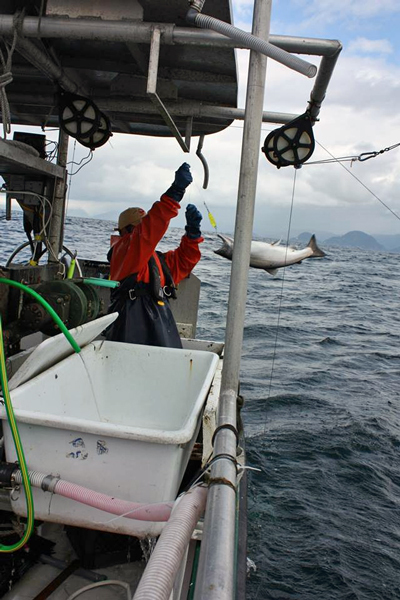 According to a 2009 study by a health-care-reform advocacy group called the Small Business Majority, 32 percent of Alaska fishermen were not covered. 75% said they preferred having the choice of a private or public health insurance plan. The Obama Administration’s Affordable Care Act of 2010 did not include a public, or government-funded option, as many had hoped. However, starting in January it will prohibit insurance companies from denying coverage for preexisting conditions. That’s an idea 84 percent of Alaska fishermen agreed with, according to the Small Business Majority poll. The new federal law will also help subsidize the cost of private insurance, depending on income. But the rates are expected to continue increasing. That’s Petersburg –Wrangell insurance owner Sue Erickson. Even Erickson wonders how long she’ll be able to insure her half-dozen employees. She says it’s critical to provide those benefits, but the cost is ridiculous for a small-group plan like hers. Erickson’s husband is a fisherman who is covered under her policy. She says it would be less expensive for him to get an individual policy but she doesn’t want him to risk changing insurance because of a preexisting back condition. Erickson suggested I make sure I’m actually covered while I’m fishing. “Anyone, It wouldn’t be just fishermen, there are some policies that exclude work-related injuries for a self-employed person,” she said. So my wife and I called the Trust and were told that in fact our plan does not cover work injuries. Sure enough, page 73 of our benefits booklet says in no uncertain terms that the plan does not cover “charges in connection with an occupational injury or illness.” I had already planned on buying insurance for my crew and now I’ll need to buy additional coverage for myself if I want to play it safe. United Fishermen of Alaska conducted a 2007 survey that found fishermen’s options for both health care delivery and insurance were limited. Access is a particular problem for the many fishermen in more rural communities without a nearby hospital. According to the survey, Alaska’s relatively small pool of potential customers and high health care costs discouraged carriers from offering individual or small business insurance packages here. For instance, injured deckhands can seek medical benefits through their skipper’s crew insurance, if they have any. By law, the Fisherman’s fund can only pay up to 10 thousand dollars per claim. Applicants can ask the program’s advisory council for more, but there’s no guarantee. In the 2012 fiscal year, Thomas says there were 670 claims and the fund paid out around 866 thousand dollars in benefits. Over the last few years, only about 11 percent of applicants had health insurance. Next articleSitka’s Water Main’s Fixed, But Who Pays For Repairs?